After more than 40 years buried in the earth near Spring Valley, a silver baby spoon will finally find its way home. The trail to the spoon's original owner, a former local resident now living in Washington, began when Spring Valley Caverns owner John Ackerman contacted the Spring Valley Tribune about a rare item he had found in a sinkhole on his property. 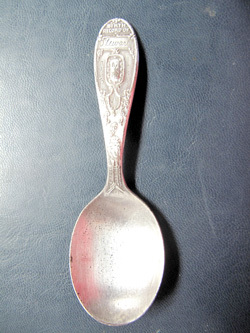 While excavating a sinkhole on the Manggaard farm, located about 5 miles north of Spring Valley, about 1.5 miles west of County Road 1 on Quilt Road, Ackerman discovered a silver baby spoon with "Stewart, Sept. 21, 1963, A. M." engraved on it. When Ackerman purchased Spring Valley Caverns in 1989 he said that the caverns were about half a mile long. "Since I am a cave explorer, I just had the inkling that I could extend this cave system. Sure enough, in 1990 I discovered another five miles of awe inspiring passages!" He said, "In 1991 I began to clean out and restore a gigantic trash-filled sinkhole on my new farm. I unearthed the spoon at that time." This is the silver baby spoon that was found in a sinkhole by owner and cave explorer John Ackerman at Spring Valley Caverns. Ackerman discusses how the discovery began. "One day, while exploring deep in the cave system, my friend Dave Gerboth and I located tiny shards of glass in a low constricting passage. I followed the trail about 100 feet, where it led to a small stand-up room." "Up in the ceiling was a hole that was clogged with garbage such as tin cans, a Barbie doll, old whiskey bottles, etc. I knew the debris had to have been washed in by a distant sinkhole, but did not know where." He added, "I ended up blasting the ceiling hole wide enough to work my body up into it, and then was able to stand up in a 15 ft. tall passage. That passage eventually led me into a new section of the cave that was never known before." Ackerman said he followed the trail of debris to a remote trash-filled sinkhole on land that did not belong to him. "I ended up purchasing that parcel, and began an arduous project to remove and recycle all the debris in the sinkhole." He noted that the top of the pile had recent trash, but as they worked their way down deeper, earlier garbage began to appear. Once they reached the base, items from the late 1800s were discovered. Ackerman said, "This trial of trash had actually been flowing deep into the cave during heavy rain events and would eventually find its way down to the groundwater. Along the major cave passage I spotted two mailbox nameplates from early owners of the farm!" One can see photos of Ackerman cleaning out the sinkhole at his website, www.karstpreserve.com/svc.html. After finding the silver baby spoon he said he originally attempted to locate the owner, but to no avail. "I have had the spoon ever since, and always intended on locating the baby who was the intended recipient of the silver spoon. Recently, I was reminded of the spoon, and so this time I decided to get serious about it!" Ackerman e-mailed this reporter with information found on the spoon. After searching birth announcements for the month of September in the bound volume of 1963 Tribunes, this reporter came across the name Stewart Musel who was born to Roger and Faith (Krieger) Musel on Sept. 21, 1963. After doing some more digging, Stewart's stepmother, Marcella Musel, stopped into the Spring Valley Tribune after being contacted. She told about how Stewart's grandparents had had silver spoons made for each of their grandchildren. She was rather certain that the spoon belonged to Stewart Musel. After contacting Stewart, who lives in Chewelah, Wash., he seemed excited to learn about the piece from his past. Stewart said, "It is kind of nice; it's like getting back a piece of my heritage and learning more about my heritage." He also added that he had been told that his grandparents had spoons made for the grandkids. "I don't know how it ended up in a sinkhole; I just remember years ago people used to throw their garbage into them," he said. Stewart noted that since he was a baby at the time, he couldn't provide more details about how the spoon was in the sinkhole on the Manggaard farm. He added that one of his older siblings might know more. Stewart's sister, Deb Peterson of the Twin Cities stopped into the Spring Valley Tribune also. She gave some facts that helped to solve the mystery of how the spoon could have ended up in the sinkhole. In an e-mail she said, "My dad actually worked for Mr. Grems (a previous owner of the farm) in the early 1960s and our family lived next door to the Grems family home." "I remember a lot of things living on that farm. My dad told us stories about finding caves when he was farming for Mr. Grems. Shortly after Stewart was born, our family moved a few miles from the Mystery Cave until my younger sister was born." It was in May 1966 that John Latchum purchased the 470-acre farm on a contract for deed from Ammon Grems. Latchum then discovered what he surmised was a newly opened sinkhole. What he discovered was a cave system now documented to be one of the most spectacular in the Upper Midwest. Ackerman said, "The Grems family claims that they knew that the caverns existed before the next owner supposedly discovered it." "However, when pressed, the Grems' said they knew of the location but never actually entered the cave and did not know if anyone ever did." As for the fate of the silver utensil that was once thrown out with the trash, Ackerman said he plans on returning the spoon to its rightful owner in the near future. After more than 40 years in the earth, the silver baby spoon will finally find its way home. For more information on the Spring Valley Caverns, go to Ackerman's website at www.cavepreserve.com/svc.html. Possible origin discovered of silver spoon found in sinkhole. A Spring Valley resident recently visited the Spring Valley Tribune with some interesting information about the silver spoon that was found in a sinkhole at Spring Valley Caverns by owner John Ackerman. Janet Czapiewski stated that she has nine silver spoons that appear to be identical to the one found but they are engraved with the name and date of birth of each of her children. She stated that her spoons came from Al Detterman who owned a drug store during the 1950’s, 1960’s and 1970’s. Czapiewski added that Detterman was a friend of hers and she could not remember if the spoons were purchased or if they were given to her. Spring Valley Historical Society director Sharon Jahn stated that Al Detterman owned Rexall Drug, which was located at 117 N. Broadway, which is now part of Spring Valley Mutual. Jahn said she discovered that Detterman became the owner of the Rexall Drug Store in 1954. Jahn said there was another drug store across the street called Sward-Kemp Drug, 104 N. Broadway Ave. (now Workout 24/7) that was run by Pete Peterson “for many years, including the 1950’s and 1960’s.